Hi all. I'm Steven from south carolina, and currently learning to grow herbs. this is my first attempt at growing anything. i am going to be container gardening as i rent an apartment and look forward to it. i've currently got a basil plant i purchased two days ago in a coffee can outside. also purchased a scraggly looking oregano plant that I'm sure needs alot of love. is there a thread out there that goes over what to do with your plants once they've gotten home? I'm doing a great deal of research, but i've always found the best way to learn is through another person's experience. thanks again ya'll have fun. Glad to have another fellow South Carolinian on the forum. There are many of us from Aiken, Camden, Kershaw, Greenville, and more. Welcome aboard and good luck with the new plants. Great to have people around that have local knowledge of climate soil conditions and all that info that I'm sure is totally important to gardening. i do have one very exciting update. i have a frog! in my basil plant, which is planted in a maxwell house coffee can. i've been gardening for like seventy two hours and i have wildlife on board!! i took a picture but I'm still setting up the whole forum life thing. To post a photo, the picture has to be hosted at a site like flickr.com. Once the photo is there, copy the URL of the photo and paste it to this site. Highlight the URL and click 'IMG'. Your photo should then show on the post. If you have more question just ask on the board or send a private message. Thats the frog! thanks, new to foruming. I love frogs. Have had a tree frog living on our balcony garden for most of this summer. I'll try to catch a photo of him next time he shows himself or herself. Great! i have a peticular fondness for frogs, i've never considered their impact on gardening. are there any peticular risks that frogs would have on a container garden? i think i've got this guy captive though. he's in a maxwell house coffee can, on the second story balcony. i may transplant him into the apartment's pond if it would suit him better. Looks like it could be a tree frog, if so, no problem as their self sticking pads allow them to climb most anywhere. Frogs are great beneficial creatures to the yard and garden. They probably eat their weight in insects every few days. Hi, welcome to this forum I am also new..but I'm from the Philippines. I can see that you love frogs..here's an image of a frog from my garden. 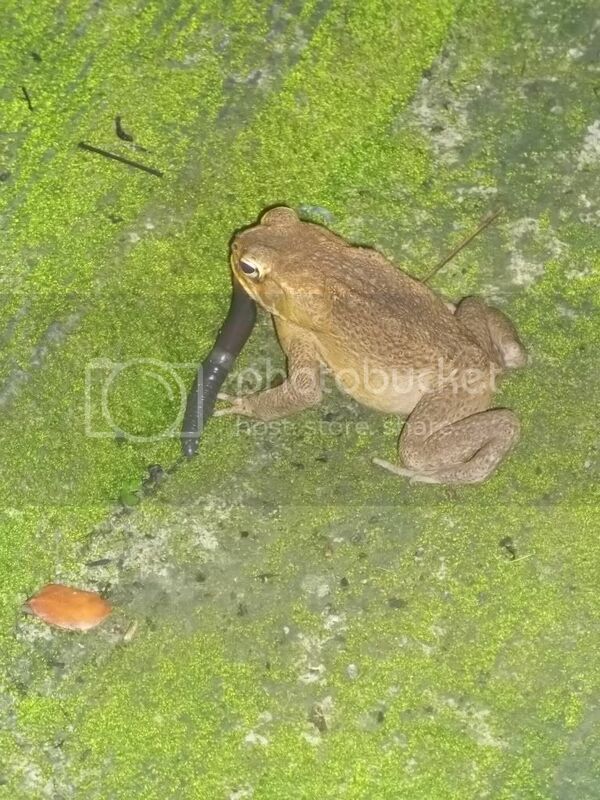 wow that frog is all over that worm in a bad way lol. must be nice to have a worm predator around! i must have lost my mind! i went from oregano and basil. to seed starting like seven different vegetables and two more herbs! i virtually destroyed my apartment in my zeal to plant plants and i couldnt be happier about it. but in this, the morning after. i cant help but feel a little like I'm coming out of a drinking binge. like.. whoa.. did i just do that??? i'll post pictures but man its going to be wild and it probably will not produce much. but i'll have fun with it anyway. thanks to all, esp. rainbow. you kept me straight even if potting soil is twice as expensive lol. Congrats on starting your porch herb garden and basil. If nobody mentioned, I might put a couple drain holes in the bottom of your coffee container. 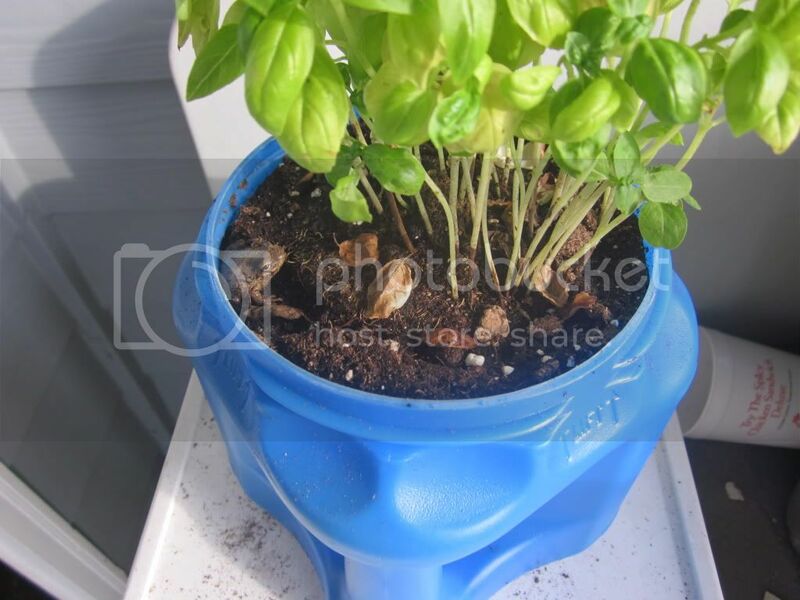 This might help keep the basil roots from standing in soggy dirt.